She doesn’t like getting those floppy ears wet. And there’s no way she’ll be trying the doggie paddle. But it seems you can lead a rabbit to water and, with the help of a bright orange buoyancy aid, make her swim. Heidi, a giant continental rabbit, has taken to her new exercise regime like a duck to water. Her owner, Amanda Williams, hopes the twice-weekly swimming sessions will help cure her four-year-old pet’s arthritis. Miss Williams, 44, pays £30 a session for Heidi to swim in the 4ft-deep hydrotherapy pool. Staff strap the rabbit into an adjustable buoyancy vest designed for small dogs and pin back her ears with a hair band. She is then placed in the heated water where she paddles up and down for about seven minutes at a time before being dried off with a towel. 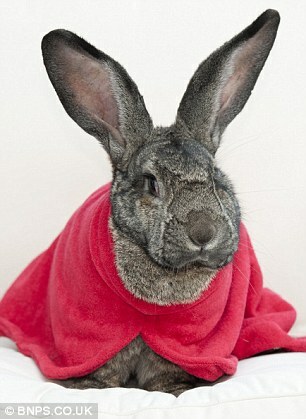 Heidi, who measures 3ft 2in from nose to tail and weighs a hefty 15lb, lives with two other rabbits in a £3,000 converted garage complete with sofas, air conditioning and carpet. She has been diagnosed with arthritis in her hips and knees and spondylosis in her neck. ‘Over Christmas Heidi just stopped moving so I took her to the vet,’ said Miss Williams, an air traffic controller from Christchurch, Dorset. 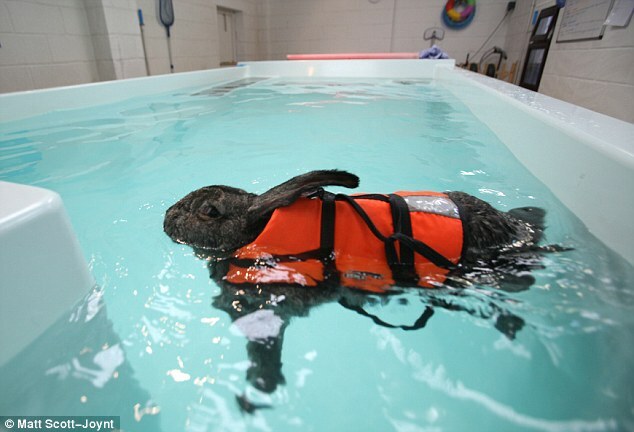 ‘He said we should try hydrotherapy, even though he had never seen it used with rabbits before. 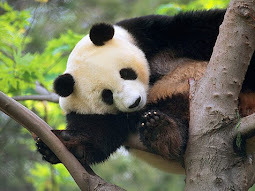 It is more usually used for horses and dogs. None of us thought she would tolerate one minute in the water but in her first session she took to it very quickly. She leapt off the platform into the pool.